The country that needs smuggled Bibles today far more than China does is North Korea, where having even just one Bible is still grounds for execution today. Until recently, North Korea was also the country that Bible smuggling organization had the toughest time penetrating. Why was it so tough to get Bibles into North Korea? First, Westerners posing as tourists cannot do Bible smuggling runs because North Korea only issues single-entry tourist visas for its government-run tours that start and end in the North Korean capital, Pyongyang, which is far from the border. Moreover, the participants in these tours stay in bugged hotel rooms and are chaperoned by government minders whenever they are outside their rooms. 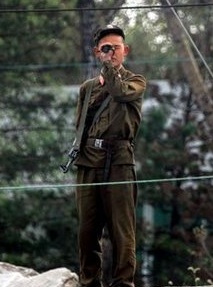 Second, entering North Korea illegally risks death. North Korea's southern border with South Korea is militarized, electric fenced and landmined, hence impregnable, while its northern border with China and Russia is guarded by North Korean soldiers with sniper rifles in hidden pillboxes and foxholes. Third, due to the world's most extreme persecution of Christianity, Christian groups in North Korea were deeply underground and seldom larger than a few families, too small to coordinate receiving Bibles in large quantities. Why does North Korea persecute Christianity so harshly? While North Korea is known to most as the last Stalinist state in the world, it is actually an anti-Christian theocracy based on a Satanic religion called Juche.